The perfect woman, according to Trump, neither defecates nor breaks wind, and Trump claims his then-girlfriend Melania, who’s now his wife, has never done either. clare at Dec. 14, 2016, 7:46 p.m.
localhuman at Dec. 14, 2016, 7:49 p.m.
clare at Dec. 14, 2016, 7:50 p.m.
hahah - so full. 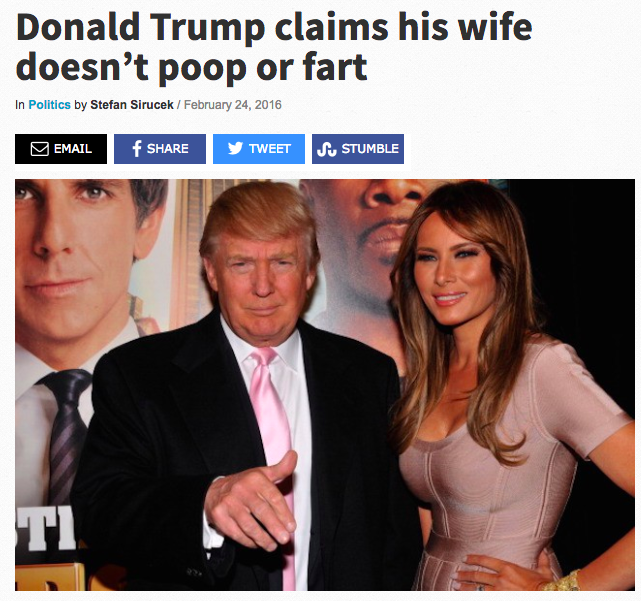 I guess she has only pooped 4 times in 3 years...just like Stern's wife.